Well what a treat that was. In the world of K-Pop, there are few bigger acts than Big Bang (Is that the right way to write it? I’m never sure – Should it be Bigbang? Or BIGBANG, even? Let’s just go with the way that makes the most English sense). Debuting nine long years ago, the YG Entertainment flagship group has been consistently at the top of the K-Pop consciousness for a while, and has amassed quite a considerable reputation in the Western music world as well. Outside of PSY and perhaps Girls’ Generation, there isn’t a more widely recognised K-Pop name than Big Bang. Just about every solo release from the group’s five extremely busy members is met with pandemonium by fans, and when all five get together, well, that’s something else. So it was a big enough deal when Big Bang announced earlier this year that they would be coming out with their first release(s) as a group since 2012. I never expected that in their subsequent world tour announcement, Australia would be included. Yes, the country ritually ignored by the big name Korean music labels, especially since the relatively disappointing – though still loud and passionate – attendance at 2011’s poorly-marketed K-Pop Festival. 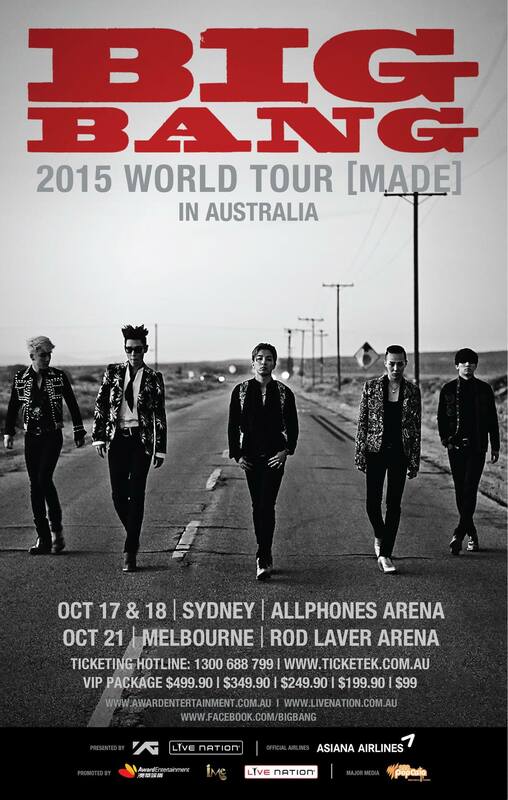 Yep, the arrival of Big Bang on our shores for the first time – for two rapidly sold-out shows no less (and a reactively added third) – is probably going to be pretty significant for Korean pop music fans down under going forward. But never mind all that. 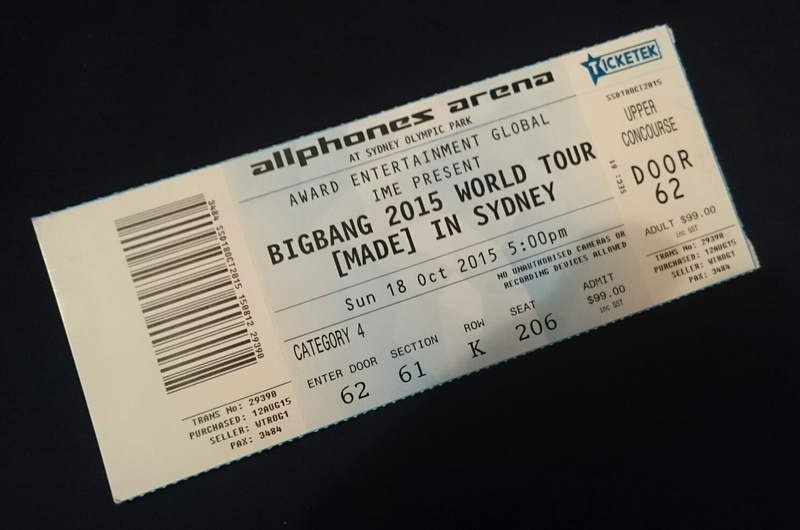 Big Bang’s second Sydney show, which I was lucky enough to attend alongside five friends, was just a really good time. I’ve been to one K-Pop concert before – B.A.P’s Live on Earth tour appearance in Sydney last year, and it was a lot of fun. But this was next level. Yeah, that’s mostly because Allphones Arena is a much bigger and more technically impressive venue than the Big Top, of course, not to mention Big Bang has more money to put into a spectacular show than B.A.P does. The boys from YG have also been around for far longer, and have built their name up over a sizeable body of work. G-Dragon, T.O.P, Daesung, Seungri and Taeyang are walking legends in their field, and they wouldn’t have had to do much to send the beyond-feverish crowd into raptures. Yet if you ask me, they matched their much younger colleagues in just about every way on stage, turning what was already a major event into one hell of a night.